I have met chiefs before. My first was the Chief of Bouchipe in Ghana, a frail man with withered skin and unbelievably thin legs. Yet his face held the wisdom of someone who had absorbed many years – someone who had seen it all. He always seemed most at peace when he sat in his chieftancy chair, a folding chair that leaned back a little too far for my comfort, though it suited him well. He would speak in his native tongue with such passion that I imagined myself sitting in front of a great leader of old, preparing us for battle. His gratitude was amazing, as he thanked us for taking an interest in his people, his place, and his environment. My favorite moment with him came towards the end of my trip. I was watching a school procession in an open field not too far from the once-clinic where we stayed. The children were marching with pride and their voices rang clear and loud when I noticed the chief walking towards us and lowered my head. I began my best attempt to give the local greeting as I offered my hand, one arm holding the other as was a customary sign of respect in these parts. I just uttered up the courage and memory to begin the pronunciation of this foreign tongue, when the chief–who spoke not a word of English to my knowledge–let out a very loud “Good morning!” He smiled as he said it, proud to have communicated with me and just looked at me cheerfully, disinterested in my efforts at formality. Instead he stood calmly next to me and the Ghananian mamas, who had gathered around to watch their children practice. I also met the chief of Siana in a full suit with grey flecks of hair gracing his head, and a runga (or small club) in his hand. Forgetting that I was not in Ghana anymore, I offered one hand, holding my own arm with the other. He seemed unimpressed and after shaking all the hands of all the men around me, he patted me on the head as an adult Masai would a child. Slightly uneasy, I began my speech about our work and the involvement of his community. It was quickly translated by his son and other important men who had come for this meeting. He offered his full support and seemed happy to have heard what I had to say. I drove him to his next destination as his son and followers piled into the car and then after a brief exchange of contact details we were off. Two days later, I would met the chief of Koiyaki. He could not have been more different. A young man, he stood in casual clothes with a phone at his side. We shook hands and talked for a while in English. At the end of our conversation, I wrote down his phone number and he introduced himself as Denis Naurori. A bulb went off in my head. Last year William Naurori had helped us out after a double puncture had left us stranded. In addition, Pilot Naurori, who was also at this meeting, was one of the tour guides at camp. After the meeting, which also went well, I asked Wilson how many Naurori brothers there were. I was thinking perhaps these were the “Three Brothers” and felt pleased to know so many members of the family. I tried not to gawk, but was dumbfounded. Twelve is a lot! Wilson just smiled at the effect. “How many wives does the chief have?” I asked. “The chief has three, Pilot has two and William has six,” Wilson went on, still smiling at my surprise. ( In case you were wondering, Wilson only has one). He conocido jefes antes. El primero fué el jefe de Bouchipe en Ghana, un hombre frágil con piel marchita y piernas increíblemente delgadas. Aún así su cara llevaba la sabiduria de alguien que ha absorvido muchos años – alguien que lo ha visto todo. El siempre se veía en paz cuando se sentaba en su silla de jefe, una silla plegable que se inclinaba hacia atrás un poco mas de lo que me gustaba, pero a el le quedaba bien. El hablaba en su idioma nativo con tal pasión que me imaginabe estar sentada al frente de un gran líder de antaño preparándonos para la guerra. Su gratitud era sorprendente, cuando nos agradecía por nuestro interes en su gente, su sitio y su ambiente. Mi momento favorito con el fue cerca del fin de mi viaje. Estaba viendo una procesion escolar en un campo abierto no muy lejos de donde se encuentra la antígua clínica donde nos quedamos. Los niños marchaban con orgullo y sus voces eran claras y fuertes cuando noté que el jefe caminaba hacia nosotros y bajé mi cabeza. Y empecé mi mejor esfuerzo para darle el saludo local y le ofrecí mi mano, un brazo sosteniendo al otro es un signo de respeto en este sitio. Y justo iba a reunir mi corage y mi memoria sobre la pronunciación de esta lengua extranjera, cuando el jefe -quien según yo no hablaba nada de inglés- dijo fuertemente “Good morning!” El sonrió mientras lo dijo, orgulloso de haberse comunicado conmigo y me vió son simpatía, desinteresado de mis esfuerzos y formalidad. En cambio se puso de pie a mi lado unto con las mamas Ganianas, quienes se habían juntado alrededor para ver la práctica de sus niños. También conocí al jefe de Siana en un traje completo con un poco de gris adornando su cabeza, y una runga (un garrote pequeño) en su mano. No se veía impresionado y luego de estrechar todas las manos de todos los hombres a mi alrededor, me dió unas palmaditas en la cabeza como los adultos Masai hacen con sus niños. Un poco incómoda, comencé mi discurso sobre nuestro trabajo y el involucramiento de su comunidad. Fué traducido rápidamente por su hijo y otros hombres importantes que habían venido a esta reunión. El ofreció su apoyo total y se vió feliz de haber oído lo que yo tenía que decir. Lo llevé en auto hasta su próximo destino junto con su hijo y otros seguidores que abarrotaron el auto, y luego de un intercambio rápido de detalles para comunicación nos fuímos. Dos días después, me reuniría con el jefe de Koiyaki. Y el fue totalmente diferente. Un hombre jóven, en ropa casual con un teléfono a su lado. Nos dimos la mano y hablamos por un rato en inglés. Al final de nuestra conversación, anoté su número de teléfono y me dijo que su nombre era Denis Naurori. Y algo hizo clic en mi cabeza. El año pasado William Naurori nos ayudó cuando se nos habían ponchado dos llantas dejándonos varados. Además, Pilot Naurori, quien estaba en esta reunión, era uno de los guías de turismo en el hotel. Luego de la reunión, que transcuyó bien, le pregunté a Wilson cuantos hermanos Naurori habían. Estaba pensando que estos eran los “tres hermanos” y me gustaba el conocer a tantos miembros de la familia. “Bueno, hay como 80 niños” dijo Wilson, “y su padre tenía 12 esposas”. Traté de no parecer sorprendida, pero estaba estupefacta. Doce son muchas! Wilson sonrió con el efecto que tuvo en mi. “¿cuantas esposas tiene el jefe?” pregunté. “El jefe tiene tres, Pilot tiene dos y William seis”, Wilson siguió su recuento, todavía sonriendo ante mi sorpresa. (Y si se lo están preguntando, Wilson tiene una). We sat at a carcass for nearly five hours yesterday. Not because nothing came, but because the vultures refused to leave. Jackals found our carcass early and I’m afraid the birds didn’t get much, but it didn’t stop them from coming. We had 11 African White-backed Vultures, five Lappet-faced Vultures, and a couple of Hooded Vultures. The White-headed Vultures have been noticeably absent, but the Hoodeds seem to be coming back this year. Carcass watching is the definitive in the ‘hurry-up-and-wait’ principle. Something one learns to live by when in Africa. There is usually a long pause after we put the carcass out where you wait for the scavengers to find it. Once the first discoverer arrives, the chaos ensues. Birds seem to drop out of the sky from nowhere and there is a feeding frenzy of epic proportions as everyone goes for whatever they can grab. During this frenzy of birds, jackals often race in at full speed and, like a bowling ball hitting its mark, the birds go flying into the air like pins. The jackals may be quick to grab but are slow to consume, especially on the tough parts like the head. For that reason there is a lot of back and forth between mammal and bird as the jackals get no peace while they try to gulp down the meat. Then, everything simmers and the birds slowly leave as the food disappears. By the end only a few birds remain but they try to make the wait worth their while by scraping every last tiny piece off of the bones. When there is nothing left, the birds preen and stretch out in the grass, their full crops sinking below their bodies. Finally after what is usually hours, a nice wind blows and the last few birds take off. After all is consumed we go to investigate the area where the carcass has been consumed, and mainly we are looking to see what has been left behind and how the insect scavengers are doing – the ants, beetle, and flies. Stepping out of the car after hours of containment is an absolute joy and I cherish my few moments of walking around. Having watched the scavenger story unfold you feel like you are standing on the stage of some great play. You remember when the jackal jumped to get the Lappet-faced Vulture right from this spot. You can see the grass pressed down where that White-backed Vulture took a nap. You find the small pile that you watched the jackal dispel after its belly was too full. Despite confidence that you know the scene, you come to realize that somehow you misplaced the props – the bones are nowhere to be found. So you wander around realizing that the bush you were so sure the bones were behind has only a few feathers. The dirt clump that you saw the Hooded Vulture on is looking very similar to the other dirt clump just a few feet away. After a long, steady sweep though, we find the bones and the rest of the aftermath of the great play. Gathering them up we weigh the remains and I note how much meat is left, if any. Driving off, I realize the actors may have flown away, but the stage remains, awaiting the next great scavenger play. Ayer nos sentamos cerca de un cadáver por casi cinco horas. No porque nadie lo visitara, pero porque los buitres no querían irse. Los chacales encontraron nuestro cadáver temprano y me preocupo que los buitres no tengan mucho, pero esto no los detuvo para venir. Tuvimos 11 buitres dorsiblancos africanos, cinco buitres orejudos, y un par de alimoches sombríos. Los buitres cabeciblancos han estado ausentes, pero los alimoches parecen estar de vuelta. Observar cadáveres está dentro del principio de “apúrese y espere” (hurry-up-and-wait). Lo que uno aprente viviendo en África. Usualmente hay una larga pausa luego de que colocamos un cadáver y esperamos que sea encontrado por carroñeros. Una vez que llega el primero, sobreviene el caos. Las aves aparecen de repente cayendo del cielo e inicia un frenezí por alimentarse donde todos van por lo que puedan tomar. Durante este frenezí de aves, los chacales a veces llegan a toda velocidad, como bolas de boliche, y las aves salen volando como bolos. Los chacales son rápidos para tomar, pero lentos para consumir, especialmente las partes duras como la cabeza. Por esta razón hay un estira y encoge entre mamíferos y aves mientras los chacales no tienen paz tratando de engullir la carne. Entonces, todo se calma y las aves se van lentamente mientras la comida desaparece. Al final solo quedan unas pocas aves que tratan de aprovechar cada pedacito de carne que aún queda en los huesos. Cuando no queda nada, las aves se acicalan y se estiran en el pasto, sus buches llenos hundiéndose en sus cuerpos. Finalmente luego de horas, una brisa sopla llevándose los últimos buitres. Cuando todo esta consumido nosotros vamos a investigar el área conde estaba el cadáver, y para ver que ha sido dejado sin consumir y como están los insectos carroñeros – las hormigas, escarabajos y moscas. Salir del carro luego de horas de confinamiento es un placer y disfruto mis momentos caminando alrededor. Habiendo visto la historia del carroñero uno siente que esta en un plató de alguna obra grandiosa. Uno recuerda cuando el chacal saltó para quitar al buitre orejudo de su sitio. Uno puede ver donde en el zacate todavía esta deprimido donde un buitre orejudo tomó una siesta. Y uno encuentra el pequeño montón que viste hacer al chacal cuando su estómago estaba muy lleno. A pesar de la confianza de conocer la escena, uno se da cuenta que de alguna manera se perdieron los accesorios – los huesos no se ven por ningún lado. Entonces uno camina alrededor y me doy cuenta que el pasto detrás del cual pensaba estaban los huesos, solo tiene unas pocas plumas. Que aquel montículo en el cual estaba el alimucho se ve igual que otros montículos. Y luego de una larga búsqueda encontramos los huesos y restos de la gran obra. Los reunimos y pesamos y anotamos cuanta carne queda, si la hay. Nos vamos y nos damos cuenta que los actores se han ido pero el plató queda, esperando la siguiente gran obra de carroñeros. We had almost reached home when I looked into a familiar tree and saw something a little less than familiar. “A leopard!” I exclaimed, and the car slowed to a stop. Wilson couldn’t believe it. The leopard was only a few hundred meters from the entrance to the park. 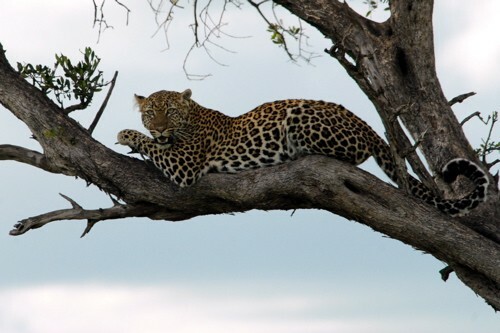 It was a small leopard, so I assumed it was female, and lounging very calmly in the tree, one foot hanging down. She looked at me with her large yellow eyes and I took a few photos. Then the mood changed. She growled at us, bearing her teeth and I looked around to try and figure out what had upset her. We were pretty far away, and if anything, I imagine she was enjoying a rare moment of piece with only one car watching her. The tree she was in was surrounded by bushes and it was difficult to see beyond it. Then Wilson remembered that when we had driven around the other side we had seen a hyena, and the hyena must have spotted the leopard too. The leopard moved uncomfortably, looking below with anxiety. Then she moved upward and I noticed something else that isn’t normally in trees – an impala carcass. Hanging delicately from the upper branches was the leopard’s kill. Something the hyena would just love to have. She moved towards the carcass and ate greedily as if it might fall to the hyena at any moment. As the leopard chewed we could hear the crunching of bones. She pushed and pulled the carcass around trying to position herself to eat better. I kept imagining that the carcass would fall as she pulled it from its stabilizing limbs. Even worse, in her precarious predicament, I worried that the leopard might fall, too – though this would be highly unlikely. After a half hour of eating and maneuvering the leopard seemed to calm down and we soon returned home only a few minutes from the park’s entrance. Casi habíamos llegado a casa cuando miré hacia un árbol familiar y vi algo menos que familiar. Exclamé “Un leopardo!” y el auto se detuvo. Wilson no podía creerlo. El leopardo estaba a sólo unos cientros de metros de la entrada del parque. Era un leopardo pequeño, entonces asumí que era una hembra, descanzando tranquilamente en el árbol, con una pata colgando. Ella me vió con sus grandes ojos amarillos y yo le tomé unas fotografías. Entonces cambió el ánimo. Ella nos gruñó, mostrando sus dientes y entonces miré a nuestro alrededor para ver que la estaba molestando. Nosotros estábamos bastante lejos, y si había algo, me imagino que ella estaba disfrutando este momento tan raro de paz con sólo un carro mirándola. El árbol donde ella estaba estaba rodeado de arbustos y era difícil ver mas allá. Entonces Wilson recordó haber visto una hiena el otro lado mientras manejabamos, y la hiena también debe de haber visto al leopardo. El leopardo se movió incómodo, viendo hacia abajo con ansiedad. Entonces, ella se movió hacia arriva y noté algo que no está comúnmente en los árboles – un cadáver de impala. Cogando delicadamente de las ramas superiores estaba la presa del leopardo. Algo que a la hiena le encataría tener. Ella se movió hacia el cadáver y comió con glotonería como si se fuera a caer para la hiena en cualquier momento. Pudimos oír el crujir de los huesos mientras el leopardo masticaba. Ella jaló y empujó el cadáver para tener una mejor posición. Y yo seguía imaginándome que el cadáver se caería mientras ella lo jalaba de las ramas que lo estabilizaban. Peor aún, en su precaria situación, me preocupaba que el leopardo cayera, aunque esto no es muy probable. Luego de media hora de comer y maniobrar, el leopardo se vió mas calmo y nosotros fuimos a casa a sólo unos minutos de la entrada del parque. 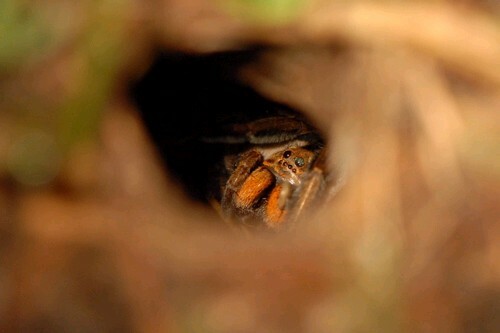 I love the little guys – the insects, the spiders, the millipedes, even the ticks. It is these small invertebrates that go unnoticed by the masses but which have the power to show us behavior just as complex as the largest mammal and for me at least, remind us of how we got into this mess in the first place. Most children don’t go out and watch elephants playing in their yard. Instead, as a child growing up in the densely packed city of New York, I grew up watching the slugs that seemed to erupt from nowhere after a heavy rain. In my few days in Nairobi, I noticed the same was true there with slugs – giant ones longer than your finger – seemed to take over the front yards of each Nairobi villa. In the Mara, the insects and spiders are many to choose from, especially at night when the lights attract them to the human domain. Even now I sit watching a jumping spider with impressively fuzzy pedipalps (front arms, if you will) launch itself from one spot to another. Last summer my days were longer and the light was shorter, so I rarely saw the lodge at night. As a result, I didn’t really notice the tiny tunnels, which seem to scatter the lawn around my tent. This field season with a bit more time to appreciate the little guys, I found myself staring intently into a hole in the ground. Bits of silk lined the edges and I knew at once what lay beneath, but would she let me see her. I plucked a sprig of grass and crouched down over the hole. I wiggled the grass gently over the burrow and sure enough a spider emerged. At one point, she came all the way out of the hole with the grass in mouth. She pulled furiously, trying to bring her “prey” back in the hole. After a moment of joy and slight exclamation, I let her back in, loosening my grip on the green stick. I soon went back for my camera. Macro in one hand and flashlight in the other, I tried for a photo. She wasn’t having it. Finally with the assistance of a small crowd of Masai staff that had gathered to see what the Vulture Mama was doing playing in the grass, I was able to get my shot. One person with the flashlight; one person luring her out with the grass; camera now steadily in two hands, I got a clear view. Zooming into the photo in the viewfinder, I pointed out the spider’s not two but six eyes and her magnificent chelicerae, which she had been using to grab the grass. The Masai seemed impressed and I soon found myself teaching a mini-spider course before we all went back to our real jobs. A few nights later, I sat in the chairs along Talek River, admiring the stars with the guests. The moths were upon us, including the giant hawk-mouth aptly named for its huge size and remarkable for its brilliantly orange eyes that glow in the lantern light. The moths fly gently and although a flutter across your ear can be a bit startling, they are totally harmless. I’m not sure if I can say the same for the dung beetles. With their hard shells and irregular flight patterns, whenever they run into something they hit it hard. I often hear the crunch of a dung beetle as it bangs into a light or hits the edge of a chair. On this particular evening, the dung beetle managed to just miss the back of a guest’s head and then to careen sideways into a side table. At the dismayed look of the tourists who had grown tired of the buzzing, I grabbed the dung beetle and held it gently upon my hand. It started crawling and I allowed it to walk one hand to the next and so on. As the guests watched in awe, I set the beetle down on my pant leg, where she (no horns or obvious male markers) wandered around quite happily for nearly 30 minutes. As our conversation progressed, I looked on as the dung beetle gave itself a bath, bringing its huge front legs up to its tiny mouth, it moved the legs around the front of its face, just as a kitten might do after a good meal. Today was a crummy day for research. We sat with our carcass for five hours this morning and nothing came. Around 11AM there was a whirlwind of bird activity with vultures and eagles alike flying over, but no one landed. We were over run with sheep and singing Masai children, who curiously asked us if we poisoned the meat, which they noticed we had put out. Interestingly, this is the general sentiment when people see what we are doing, they assume we poisoned the meat. We explain that we are doing reasearch and assure them that we haven’t poisoned anything and are in fact trying to learn more about the wildlife so that we can help conserve it. In the afternoon, we were driving along searching for future places to put carcasses when I noticed something rushing through the grass. We were driving on an elevated part of the road. Usually when you see something moving fast it turns out to be the top of another car, so I didn’t get too excited. Then I looked ahead – the gazelles were quickly fleeing, spreading wide across the plains. Looking back at the rushing form and ahead to the gazelles, it was clear who was about to die. The singled-out gazelle leaped wildly and swerved, but it was no hope, the cheetah was fast on its tail. Within seconds, the two had vanished in the grass ahead of us. Did she get her? As we moved forward to see, I noticed another smaller cheetah with a large tuffed mane, obviously a cub, following as well. She stopped looking desperate and as lost as were we. Then she chirped. I’ve heard it before but it really is an odd and unflattering sound for a cat to make. Like a chick, she spread her mouth wide and made the noise again. A low growl could be heard up ahead and we followed the cub to her mother. She had gotten the gazelle. It lay flat and immobile in the short grass. The mother was heaving, breathing so hard she looked like she might collapse, eventually she did. The cub dug in. Ripping and chewing with its canines it made a delicate incision and was soon covered with blood. Then the bone crunching started. As the cub ate, the cars started to come and our moment of solitude with the cheetahs was over. Amazingly, we were the only ones to actually witnessed the kill but, like vultures to a carcass, the tourist vehicles were soon pulling in everywhere to surround the cheetah. Desperate for a tasty morsel of the action and perhaps a good photo, they crept closer and closer. The mother looked on nervously and then Wilson noticed a new arrival. A hyena was wandering the grass ahead. With all the cars around it was sure to realize something was up. 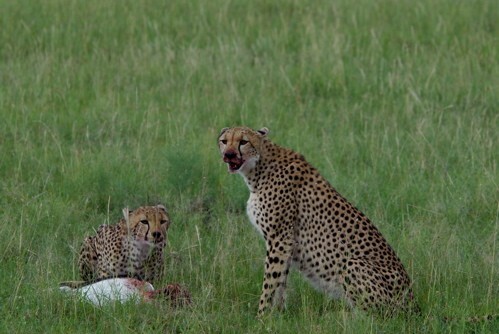 The mother cheetah joined her offspring and ate as much as she could. When the hyena arrived I figured the cats would flee, but instead they stood on and raised the hair on their backs and glared angrily at the hyena. They moved off slightly as the hyena ate and then dragged off the carcass. At this point a large truck passed the crowd and a tucking baby gazelle got up and ran (this one’s for you Blair). The mother cheetah picked up on it immediately and amazingly given her exhaustion, she went in for the second kill. Crouching low, I watched her race up to the baby who swerved around but was easily nailed. The cub soon joined and once again the cheetahs were eating. The sky is speaking. It grumbles and rumbles and crackles, squealing with rage like a toddler unable to get its way. Then finally it breaks like the thunder that accompanies it, the rain crashed to earth and splatters the floor. Luckily, I am done for the day. For some reason, it has been raining mainly in the afternoons. 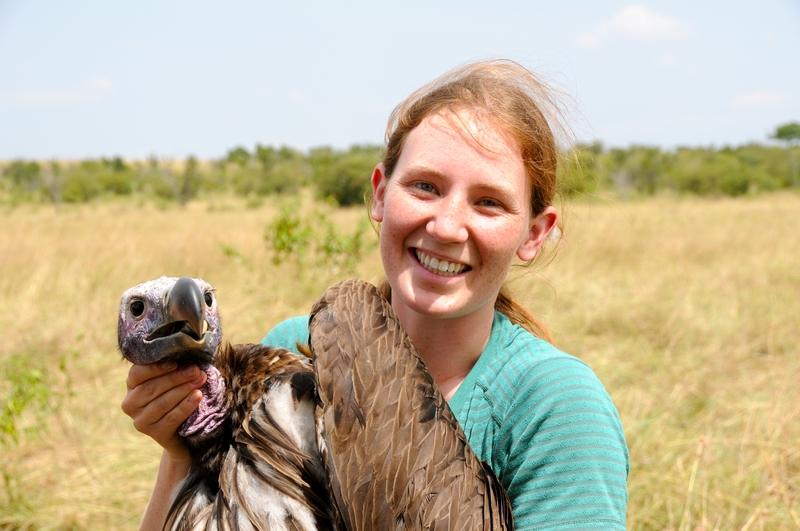 This is good news for me since the rain virtually shuts down vulture activity. As is I have time for my carcass experiments and transects in the morning and seem to get done just as the sky is threatening to fall. It is a hard rain and I sit outside under canvas surrounded by the droplets. Within seconds pools of mud form and I can only wonder what the roads will be like tomorrow. Oh my God, it is hailing!! I can’t believe it. At first, it looked like little frogs were jumping around magically erupting from the soil (which they are, one just joined me under the tent), but that was actually hail. I just got up and grabbed a piece to confirm and indeed, ice just fell from the sky in Africa. Be amazed! But now it is just raining again. So back to the wildlife. The Mara is filled with carnivores – hungry carnivores. To the extent that I am actually seeing changes in the carcass experiments. I put out small pieces of meat every morning (just a head, organs, and leg) to look at differences in foraging behavior between vulture species depending on the habitat. Last summer I had the occasional lions, jackals, and hyena, even a feral dog or two, but this season every carcass (and I have done three so far) has been finished off by a greedy mammalian scavenger. My first carcass worked like clockwork – Bateleur eagle finds the carcass, followed by a Tawny eagle who steals the carcass, followed by a variety of vultures – in this particular case the African white-backed vulture and some Hooded vultures, then before I know it comes a jackal, which isn’t too surprising, but the jackal is followed by not one but two starving lions. One is limping, so her pride mate makes it to the meat first and quickly devours the head. Later in the day, I follow some Lappet-faced vultures to another kill, which turned out to be a baby gazelle. I wasn’t the only one that followed – again the carcass was over-run by a jackal and soon the limping lion was racing her way in too. She grabbed a leg and growling at the lioness behind her, chomped away. After the lions have finished off what little remained, a hyena dropped by sullenly looking for a few tidbits, but the lions had taken care of that. The next day we had a long wait for the birds, but they finally arrived and in number. We had 2 Tawny eagles, 3 Lappet-faced Vultures, 21 African White-backed Vultures, a handsome male White-headed Vulture, and last but not least a tiny Hooded Vulture with beautiful blue-eyes. I had just started to take in all the vulture action, when the mammals crashed the party. 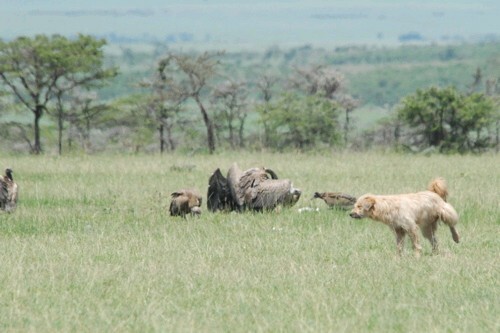 A jackal raced in stealing a piece from the Lappet-faced Vultures, then a hyena dropped by and grabbed the head. Most surprisingly of all, a fluffy Bengi-looking dog ran up and searched for a piece. He hung around for a while, but didn’t get much and was soon barking at the hyena. The hyena didn’t seem scared in the least and walked towards the dog in protest. Soon the dog was racing towards us sticking close to the car as it looked over its shoulder at the unfamiliar beast. This morning’s carcass was short a sweet. Just as it was getting warm enough for the birds, four jackals crept in and each grabbed its own piece (the goat leg nearly bigger than its carrier) and ran off. So much for vulture behavioral observations! We made a day of it by scoping out our next area to place a carcass. This meant a drive through the nearby community area of Siana. The day was filled with naked bathing children, colorfully clad Masai women asking for a ride to the market (they seemed very confused that we didn’t even really know where we were going, just looking, we explained. Genuinely we are just looking around for a few good carcass placement spots). We soon found the strangest thing of all: right on the road was a Leopard tortoise – small and adorable. I hoped out of the car to pick him up and move him to safety and he didn’t seem to find. Then I noticed something odd. 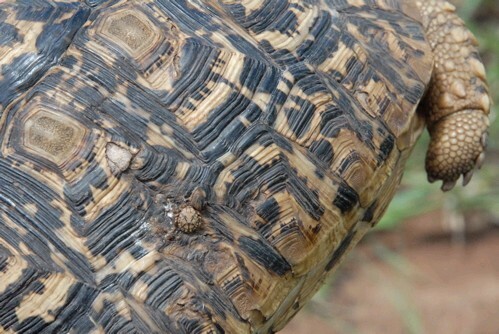 The tortoise was covered in ticks, but not on his legs or neck as one might expect – on his shell! There they were five huge striped yellow ticks camouflaging into the tortoise’s carapace. My immediate reaction (having many years of zoo and wildlife clinic work experience, which is not always best suited for the bush) was to pull off the ticks. One by one, I ripped them from the shell, expecting to find some huge gapping wound underneath. Instead beneath each tick was a small pinprick hole – about the size of the tick’s mouthparts – drilled delicately into the shell. Did the ticks really eat their way through? I stopped myself before pulling off the last one to take a quick photo of the tick-on-shell action. Then as I pulled off the remaining tick, the tortoise thanked me for my troubles by urinating all over my hand. I guess enough was enough. I set him down and he walked away. El cielo habla. Se queja, hace ruidos y cruje, gritando con rabia como un niño pequeño que no puede salirse con la suya. Y entonces se quiebra como el trueno que lo acompaña, la lluvia se estrella contra la tierra y salpica el suelo. Por suerte, he terminado por el día. Por alguna razón, ha estado lloviendo solo en las tardes. Son buenas noticias para mi ya que la lluvia detiene prácticamente toda actividad de los buitres. Así tengo tiempo para mis experimentos con cadáveres y transectos en la mañana y acabo justo cuando el cielo amenaza con lluvia. La lluvia es fuerte hoy y me siento afuera bajo la carpa rodeada de gotas que salpican. En segundos, pequeñas piscinas de lodo se forman y nada más me imagino como estarán los caminos mañana. Dios mío! esta cayendo escarcha! No puedo creerlo. Al principio, parecía como si pequeñas ranas estuvieran eruptando del suelo (lo cual es cierto porque una se me acaba de unir debajo de la carpa), pero es en efecto escarcha. Me acabo de levantar a tomar un pedazo para confirmar, y en efecto, acaba de caer hielo del cielo en Africa. Sorpréndanse! Pero ahora sólo llueve otra vez. De vuelta a la vida silvestre. El Mara está lleno de carnívoros – carnívoros ambrientos. Tanto así que estoy viendo cambios en los experimentos con cadáveres. Coloco pequeñas piezas de carne cada mañana (sólo la cabeza, órganos y pierna) para observar diferencias en el comportamiento de forrageo entre especies de buitre dependiendo del hábitat. El verano pasado visitaron ocasionalmente a los cadáveres, leones, chacales e hienas, inclusive uno que otro perro salvaje, pero esta estación cada cadáver (he hecho tres hasta ahora) ha sido devorado por un avaro mamífero carroñero. Mi primer cadáver funcionó como un relog suizo – Un águila volantinera encuentra el cadáver, seguida por un águila rapaz quien se roba el cadáver, seguida por varios buitres – en este caso particular un dorsiblanco africano y algunos alimoches sombríos, y luego, antes que me diera cuenta, vino un chacal, lo que no es sorprendente, pero el chacal es seguido por no uno pero dos leones ambrientos. Uno está cojeando, pero su orgulloso compañero llega primero al cadáver y devora la cabeza. Más tarde, sigo algunos buitres orejudos a otro cadáver, que resulta ser una gacela muy joven. No fuí la única que los siguió – otra vez el cadáver fué devorado por un chacal y pronto el león cojo estaba apurándose hacia la presa. Ella tomó una pierna y se alejó gruñendo a las otras leonas detras de ella. Cuando los leones terminaron lo poco que quedaba, una hiena pasó por ahi buscando por sobras, pero los leones no dejaron nada. El siguiente día esperamos mucho por las aves, pero llegaron al fin y en gran cantidad. Tuvimos dos águilas rapaz, tres buitres orejudos, 21 buitres dorsiblanco africano, un macho muy hermoso de buitre de cabeza blanca, y un pequeño alimoche sombrío, con lindos ojos azules. Empezaba a ver toda la escena de los buitres, cuando los mamíferos llegaron a la fiesta. Un chacal corrió a robarle a los buitres orejudos, entonces una hiena llegó y tomó la cabeza. Más sorprendente aún, un perro peludo parecido a Bengi corrió y buscó un poco de carne. Se quedó por un rato, pero no encontró mucho y pronto estaba ladrando a la hiena. La hiena no parecía asustada del todo y se acercó al perro en protesta. Pronto el perro corría hacia nosotros quedandose cerca del carro mirando sobre sus hombros hacia la hiena. La actividad en el cadaver de esta mañana fue corta y dulce. Justo cuando estaba suficientemente caliente para las aves, cuatro chacales llegaron y tomaron cada uno un pedazo (la pierna de chivo casi tan grande como el chacal) y se fueron. No quedó mucho para observación del comportamiento de los buitres! Y aprovechamos el día entonces buscando nuestro próximo sitio para ubicar un cadáver. Para ello manejamos a traves de la comunidad cercana de Siana. El día estuvo lleno de niños bañandose desnudos, mujeres Masai de vestidos coloridos pidiendo aventón hacia el mercado (parecían confundidas al saber que nosotros no sabíamos a donde ibamos, y sólo estabamos “viendo”, les explicamos, cuando era totalmente cierto que solo buscabamos un buen sitio para colocar el cadáver). Pronto encontramos algo muy extraño: una tortuga leopardo en el camino – pequeña y adorable. Me bajé del carro y lo moví a un sitio seguro, lo que no pareció molestarle. Entonces noté algo extraño. La tortuga estaba cubierta de garrapatas, pero no en sus piernas o cuello, lo que uno esperaría – estaban en su caparazón!. Eran cinco inmensas garrapatas amarillas con rayas que se camuflaban en el caparazón de la tortuga. Mi reacción inmediata (teniendo muchos años de experiencia en zoologicos y clínicas de vida silvestre… lo que no es muy útil en el campo) fué el quitarle las garrapatas. Una a una, se las quité del caparazón, esperando algún tipo de herida. Al contrario, debajo de cada garrapata había un diminuto agujero – similar al tamaño de las piezas bucales de la garrapata – taladrado cuidadosamente en el caparazón. ¿Las garrapatas deveras hicieron este agujero? Me detuve antes de quitar la última para fotografiar esta interacción. Y entonces, cuando quité la última garrapata, la tortuga me agradeció la molestia orinándose en mi mano. Creo que ya era suficiente y lo dejé ir. Sleeping in a tent never really worries me. I know and trust the bush and enjoy the exhilaration of knowing a hippo could be standing just outside my bedroom door. Despite that I must admit that on the walk back from dinner, I often find myself jumping at shadows, but that is usually because I am distracted by the stars. An African once asked me why Westerners always stare at the stars, don’t we have stars at home. Of course I told him, we have stars. . . just not like this. In the Mara the stars fill the sky, like little drops of dew across a window. Orion’s belt shows clear and I always find myself searching for the bow and arrow, but lack the imagination to find them. Today the moon had greeted me on my arrival and it lit my path for the journey to bed. After a gloriously warm shower, I tucked myself in. I had the usual surprise of feeling something warm and rubbery beneath the covers, but was quick to remember that it was only a water bottle. It hasn’t been nearly as cold in the evenings here since I have returned and I actually pulled it aside. The drive in was exhausting and I fell asleep without even a single toss or turn, the mournful call of the hyena singing me to sleep. I awoke to a rustling at the tent door. In a half daze I went to turn on the lights, but quickly realized the electricity was out (it must be really late). I pulled on my headlamp to see clawing at the highest point on the tent door. In addition to the scratching sound, I could actually see the tiny claws piercing through the canvas. I thought first of the little genet that had once gotten trapped in my room, feasting upon a leftover banana peel, perhaps the little cat had come back for more. Or maybe it was something bigger, looking for a larger meal. Leopards love the waterfront and my tent is literally meters from the riverbank. My first instinct was to leave it alone. Whatever it was surely it would realize there was no way in and it would leave. Fifteen minutes later the scratching rang on and with a bit of adrenaline now racing through my veins there was no way I was going back to sleep. I stood up nervously and shown my headlamp at the tiny nails that continued to press upon the tent wall. I gently tapped on the canvas hoping this subtle cue would scare away my unwelcome visitor, whoever he was, but it seemed to have no effect. A bit more courageously I tapped on the area where the claws were coming through but again no reaction. I opened the bottom of the tent and peaked through, but I couldn’t see anything. I imagined an angry genet falling on to my head as I unzipped the rest of the door. I couldn’t see anything, but the sound hadn’t stopped. With my heart in my throat I stepped out of the tent into the absolute darkness. I zipped the inner lining closed to keep out the mosquitoes and looked around. Scratching desperately at the tent in between the lining and the outer canvas was the largest dung beetle I had ever seen. It would easily have filled the palm of my hand and it was climbing but not really getting anywhere. Looking at it I remembered how a dung beetle had once gotten stuck in my brother’s shirt. It dug so fiercely to get out my brother was convinced that it was trying to burrow into his skin, like the scarabs from the Mummy. I reached up and tapped the beetle on the back. He plummeted the six feet from the top of the tent down to the floor landing (classically) on his back. I flipped him and shooed him on his way, making sure that he wasn’t going to climb the tent walls again. Finally I got some rest. Nunca me he preocupado de dormir en una tienda. Conozco y confío en el campo y disfruto la alegría de saber que un hipopótamos puede estar afuera de mi tienda. Aparte de ello, debo de admitir que todas las noches en mi caminata devuelta de la cena, me sobresalto con cada sombra, pero ello es usualmente porque estoy distraída con las estrellas. Un africano me preguntó una vez porque los occidentales siempre miran atónitos a las estrellas, ¿no tenemos estrellas en casa? Por supuesto! le dije… pero no como estas. En el Mara las estrellas llenan el cielo, como pequeñas gotas de rocío en la ventana. El cinturón de orión se ve claro y siempre me encuentro buscando por el arco y la flecha, pero no tengo tanta imaginación. Hoy la luna me recibió e iluminó mi camino a la cama. Luego de un glorioso baño caliente, me acosté. Y tuve el sobresalto usual al sentir algo cálido y huloso debajo de las cobijas, pero recordé rápidamente que era la botella de agua. No ha estado muy frio en las noches últimamente y la puse a un lado. Manejar hasta aquí fue me dejó exhausta y me dormí sin siquiera dar una vuelta, el lamento de la hiena cantandome para dormir. Me desperté con un ruido en la puerta de la tienda. Medio despierta fuí a encender las luces, pero me dí cuenta que no había electricidad (debe de haber sido muy tarde). Busqué mi linterna y ví que habían unas uñas en la parte superior de la puerta de la tienda. Y además un sonido de rascado. Y pude ver las pequeñas garras a través del material de la tienda. Pensé que era la pequeña gineta que había quedado atrapada en mi cuarto devorando una cáscara de banano, talves el pequeño gato había vuelto por más. O talves era algo más grande buscando una comida más grande. Los leopardos gustan del agua y mi tienda está literalmente a escasos metros de la rivera del rio. Mi primer insinto fue dejarlo en paz. Lo que fuera pronto se daría cuenta que no había manera de entrar y pronto se iría. Quince minutos más tarde, la rascadera seguía y con la adrenalina ahora corriendo por mis venas, no había manera que me fuera a dormir. Me levanté nerviosamente y apunté mi linterna hacia las pequeñas garras que todavía estaban en la puerta de la tienda. Les dí un pequeño golpe sin reacción alguna. Abrí la parte baja de la tienda y miré hacia afuera pero no pude ver nada. No veía nada pero el sonido no paraba. Con el corazón en mi garganta salí de la tienda a la completa oscuridad, cerré el ziper interior para mantener los mosquitos fuera y miré alrededor. Rascando desesperadamente en la tienda, entre el mosquitero y la parte de afuera estaba el escarabajo ruedacaca más grande que he visto. Era tan grande como la palma de mi mano y el pobre no iba para ningún lado. Me acordé de la vez cuando un escarabajo se enredó en la camiseta de mi hermano. Estaba rascando tan fuertemente que mi hermano pensó que iba a perforar su piel, como los escarabajos de la película La Momia. Le dí un pequeño golpe en el dorso y rápidamente se dejó caer hasta el suelo, aterrizando (clásico) en su espalda. Le dí vuelta y lo puse a caminar, asegurandose que no se fuera a subir en la tienda denuevo. Finalmente pude descanzar.